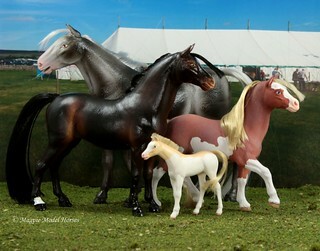 Magpie Model Horses, previously known as Dream Ponies and Magpie Models, is one of the few remaining foundation British model horse companies. Magpies are 1/12th scale, hollow, hard plastic models with synthetic hair manes and tails. Models are produced, assembled, and hand-painted here in the UK. Magpie Model Horses are collectibles and are not intended as toys. While official Magpie Model Horses news and announcements can only be found here, there are other forums which discuss Magpies. The Magpie Message Board (not moderated by or otherwise associated with Magpie Model Horses) is an excellent source of Magpie history and pictures though it's been fairly quiet since 2009; hopefully it will soon come back to life. Model Horse Love is the main forum for British colletors and is a brilliant place to chat and hear the latest model horse news and gossip.